This is how some of the training manuals described the sprinter’s technique. An athlete who embodied this technique was Ian Rutgers. Ian Rutgers, third from left in the third row, was part of the Western Province team in 1985 after a four-year layoff. He won the SA senior men’s 200m and came second in the 100m at the SAAAB championships in Port Elizabeth. Some might argue that he was a gifted sprinter because of the manner in which he sprinted. But the athlete himself recalls how he was run “to pieces” when he got to Bishop Lavis High School in Std 6 (grade 8) in 1974. “I was run to pieces in my first year in standard 6,” he says with laughter, but I would “practice to do that the following year to my rivals”. Bearing down on him was Selwyn Thomas of Cathkin High School in Heideveld. Many rated Thomas as a fearless exponent of the sprint events. Thomas was the next hot property after Terrence Smith of Heathfield High School (1973), setting the records in the boys’ under 15 100m (11,0 seconds), 200m (22,7 seconds) and long jump (6,60m) and the 4x100m (45,4 seconds) relay at South African Senior Schools Sports Association (SASSSA) level in 1975. 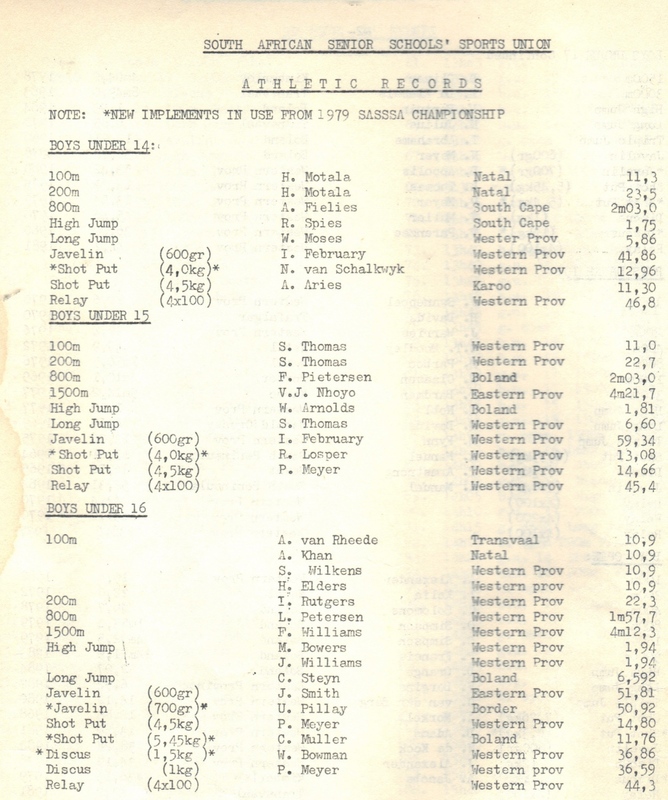 The page from the WPSSSU record book that verifies Ian Rutgers’ SA schools’ under 16 200m record set in 1976. 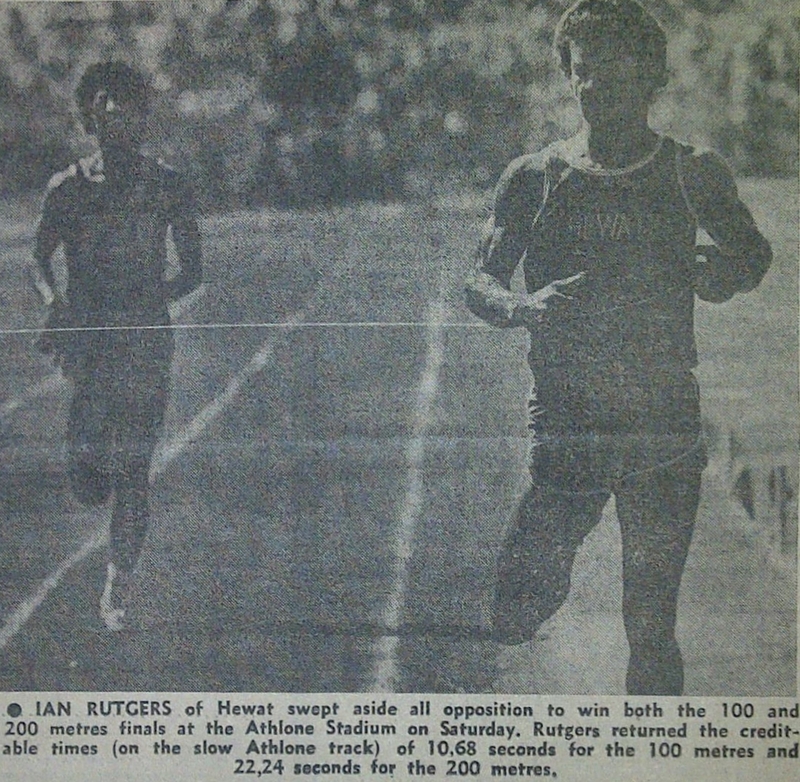 By 1976, Rutgers altered the one-sided rivalry, setting the SASSSA boys under 16 200m record of 22, 3 seconds in Kimberley, as well as the WPSSSU boys under 17 long jump record of 6,71m. No longer was their competition one-way traffic. 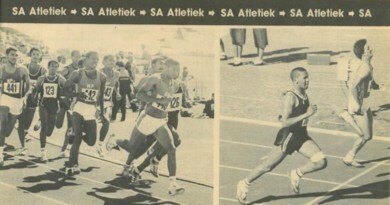 Rutgers’ SASSSA boys under 16 200m record stood until 1985 when the talent of Shaun Vester of Western Province (Grassdale and Grassy Park) improved the mark to 22,1 seconds. In between, there was a galaxy of sprint stars unable to break the record. By now Rutgers was starting to come into his own. 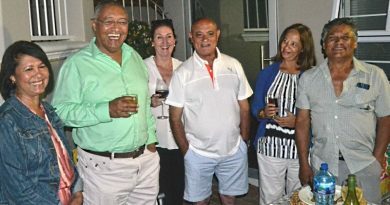 Dr Richard Rive, the former South Peninsula High School’s athletics coach and English lecturer at Hewat Training College, had recommended the Spartans Amateur Athletics Club to Rutgers. While at Hewat, Rutgers dominated the WPSSSU boys’ open sprints (1978-80). “The late Dr. [Richard] Rive knew my athlete brother [Andy Rutgers] and saw my potential and took me to join Spartans,” recalls Rutgers who was ruling the roost at senior schools. 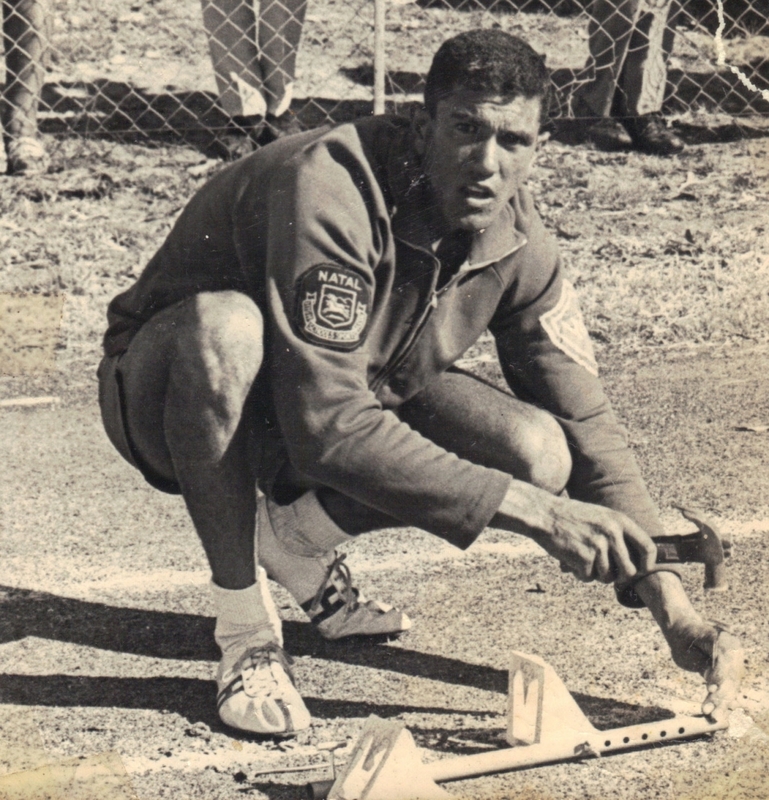 Richard Rive’s contribution to athletics was immense both at South Peninsula High School and at the Western Province Senior Schools’ Sports Union. He says with uninhibited laughter that he had “no real coach as Robin April, then the coach at Spartans described me as “the laziest athlete he had ever come across as part of a team”. Mostly, Rutgers comes across as modest in the interview. He was reluctant to talk about his training programme. Even for an athlete of his talent who had been run “to pieces” in grade 8, his improvement through the age groups could not have been on honey, toast and fresh air alone. This is clear as no athlete after a four-year absence (1980-1984), steps onto a tartan track for the first time as a senior men’s athlete and clocks 10,5 seconds in the 100m and 21,7 seconds in the 200m at age 25. To boot, he had won the senior men’s 200m at the South African Amateur Athletics Board (SAAAB) track and field championships in Port Elizabeth. He looked trim and muscular in 1985, much like he did while an athlete at high school. 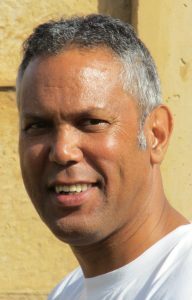 He made the South African Amateur Athletics Board team in 1985 on the back of his SA title in the 200m and a second place in the 100m to Nazeem Smith. Robin April was a top midddle distance athlete in the late 1960 while at Hewat Training College. 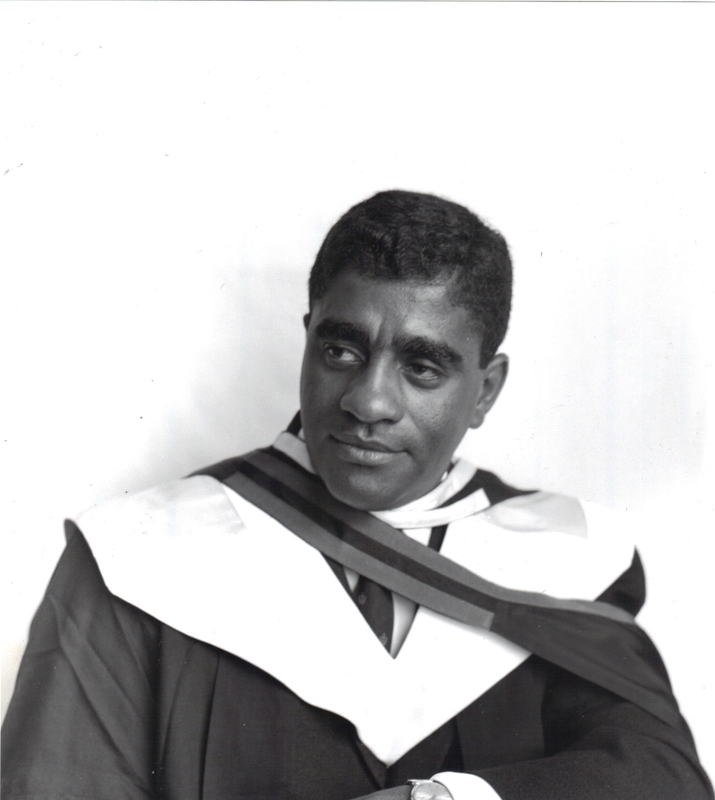 He was also a founder member of the Spartans and Hewat athletics clubs. As a club athlete at Spartans, Rutgers believed in the Andrewena Series which was a competition for athletics. He believed the competition gave you the opportunity to prepare for bigger meetings, and Rutgers was a big meet competitor. “Yes, the Andrewena Series was good preparation for bigger meetings. At the time, the areas were safe for families to go out and support athletics. Walking home safely was never an issue,” he says. The issue was on the track where he had to put to bed several of his rivals. He did have the odd defeat but it wasn’t earth shattering. His team mate Keith Cyster comes to mind in a race on the cinder track of Hewat. Russell Lykert of Hewat, Christopher Johnson of Grassy Park, and Lesley Burgess of Spartans were some of his other competitors. Lykert and Johnson also had the opportunity to beat Rutgers in the 100m. The 200m was an altogether different race for Rutgers where he consolidated his sprinting prowess. 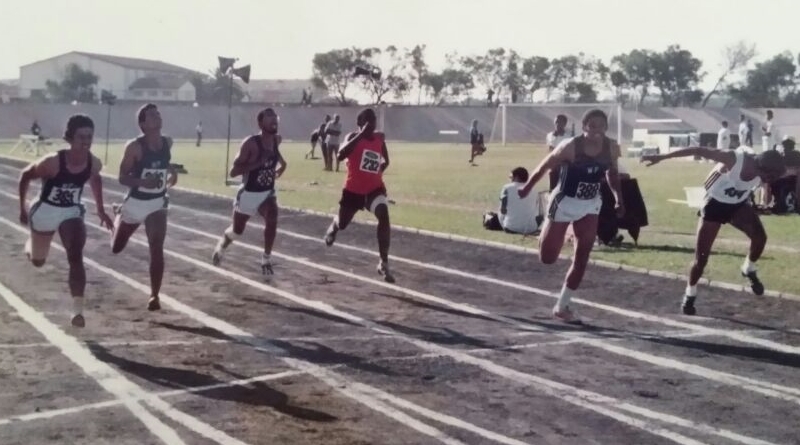 Ian Rutgers, second from left, made a return to athletics in 1985 and was placed second in the 100m and first in the 200m at the SAAAB Championships in Port Elizabeth. Rutgers was part of a fabulous Hewat Training College relay quartet made up of Jeremy van Wyk, Lykert and Cyster. They held the 4x100m record in 1979 with a time of 42,5 seconds. His success on the track was on the back of a series of club meetings from Allenby Drive in Retreat in the southern suburbs to Bellville South in the northern suburbs. Athlone Stadium had taken the central stage with a series of floodlit meetings being held there in the 1970’s. 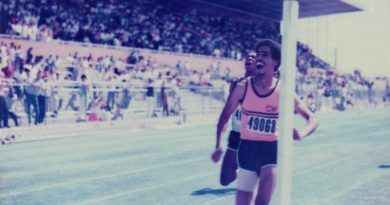 Rutgers was the South African Amateur Athletics Board’s junior men’s 200m champion in 1977 equalling Edmund Lewis’s then record of 22,1 seconds in Port Elizabeth. 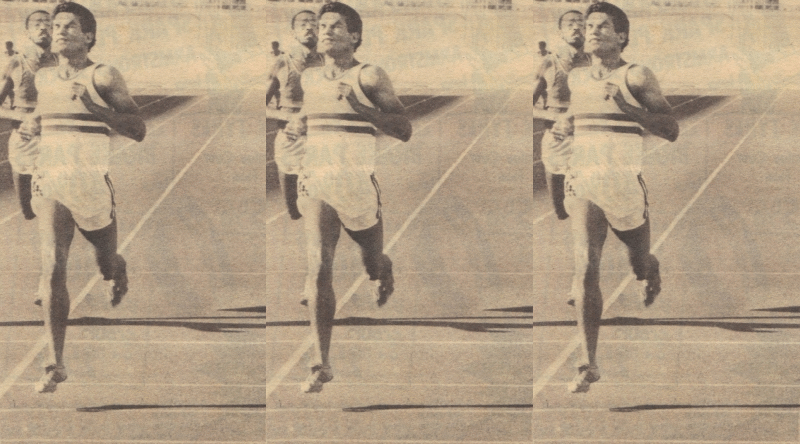 In 1978, he was the SAAAB junior men’s 200m, 400m and long jump champion in Paarl. His 400m time of 50,2 seconds was pretty good at that stage. Ian Rutgers, fifth from right in the middle row, was selected to the first SAAAB team in 1985 at the time of the first SAAAB Prestige meeting at the Vygieskraal Stadium. The other units who made up the competition at the Prestige meeting were the colleges and senior schools. He was the champion again in 1979, while representing the SA Colleges, with Michael Chitter (WP) of the Heathfield High (SP club) as his understudy in both sprints. The SA Board championships were held in Durban, the year Robin Mclean of Eastern Province won both the 100m and 200m at senior level. One such reason is the fact that there were more meetings at club level than at high school level where only two athletics meetings were held (inter-schools and champion of champions). Of course, the inter-house school meetings were a precursor to the two big school meetings. 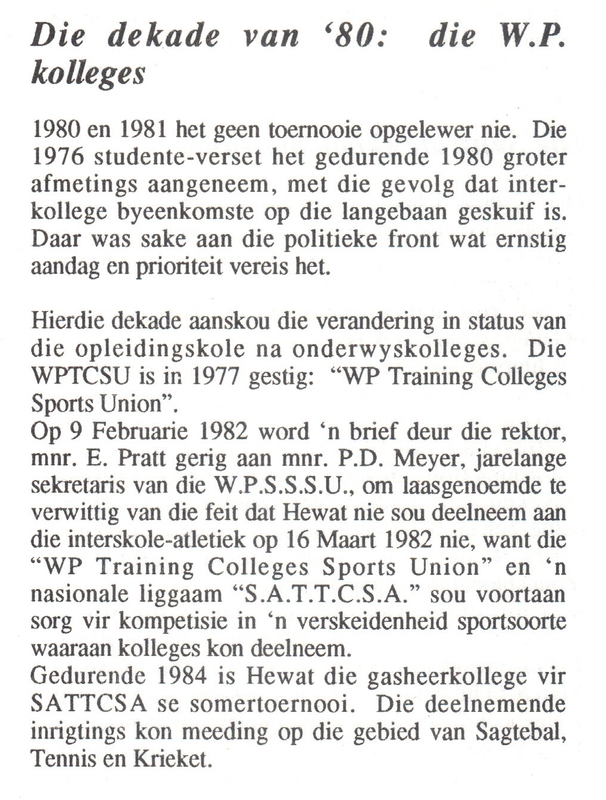 An extract from the Hewat Training College magazine which cites the withdrawal of the college from WPSSSU in 1982. But perhaps, central to the Rutgers story is the fact that, in 1979, he became the second seven-metre long jumper while still a student teacher at Hewat when he set a record of 7,01m on the grass surface at the Athlone Stadium. Garret Watts of Boland was the first athlete to clear seven metres in 1978 in the same distance of 7,01m. Rutgers had done well in the long jump on a consistent basis and even held the Western Province Amateur Athletics Union’s junior men’s long jump record. But he reckons, the long jump was not his favourite event. “No, the long jumping came as part of running and I was playing around with the distance,” says Rutgers who is the deputy principal at Littlewood in Mitchell’s Plain. The Hewat record books indicate that Rutgers had indeed cleared 7,01m in 1979. During those years Hewat Training College competed under the auspices of the Western Province Senior Schools’ Sports Union and Hewat athletes even received WPSSSU colours. There was no such luck for subsequent athletes at Hewat as on February 9, 1982 a letter by the Rector Eddie Pratt had been sent to the secretary of the WPSSSU Peter Meyer informing the senior schools’ union that Hewat will no longer be participating at WPSSSU meetings. Ian Rutgers of Hewat in action in the boys open 200m at the Athlone Stadium in 1980. 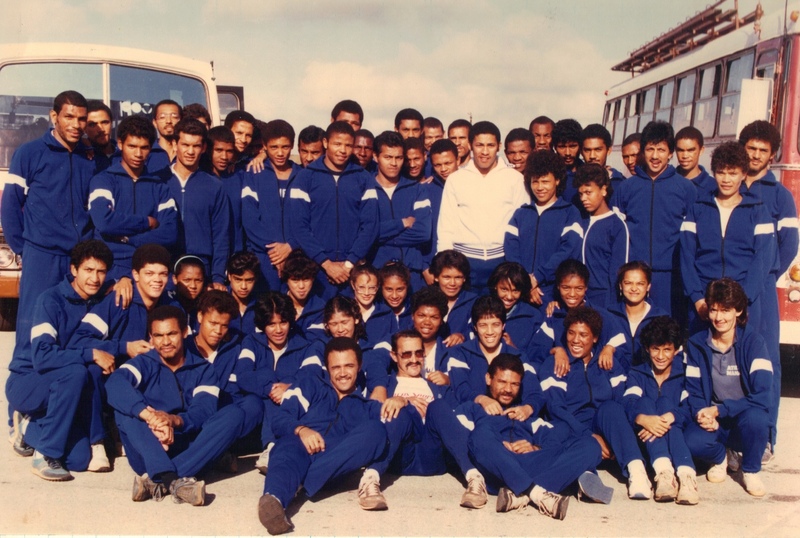 Research shows that the Western Province Colleges’ Sports Union was established in 1977 and that an SA colleges’ team had participated in meetings such as the SA Board championships as early as 1976. Hewat was the only college who was still a member of the WPSSSU in 1982. 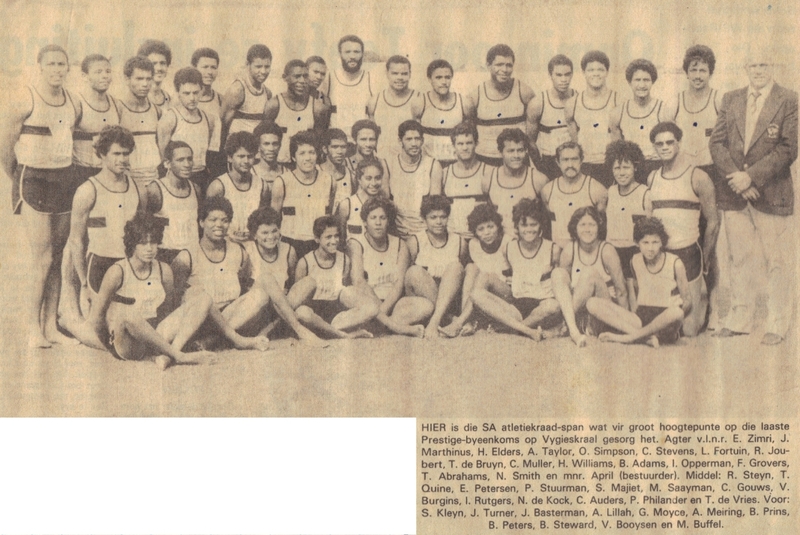 Rutgers represented the South African Teacher Training Colleges Sports Association Track and Field team in 1979 (SATTCSA), a prestigious team which in that period included athletes of the calibre of O’Neill Simpson (BTC), Trevor de Bruyn (HTC), Ronel Juries (HTC) and Ruwayda Noor (Henry) of Bechet Teachers’ College in Durban – all who have made their mark at senior schools and club level. It is with awe and fond memories I recall our (Ian and myself), rivalry in the Boy’s Open long jump event at the Champion and Champion’s Athletic meeting at Athlone Stadium in 1979. Ian represented Hewat Training College and myself representing Heathfield High School, and a few years his junior. A week before I broke the SA National Schools record. I am not sure at what distance the record stood at, but my distance was 6.65m. Of course, this comment of mine is written “off the cuff”, when I accidentally came across it when a friend posted this website to me showing me clearing the hurdles in 1975 at the Belville cinder track. Therefore, I need to put in more research concerning times, dates and distances. The setting of this record was also not without a bit of controversy, which is not the concern at the moment. I recall a week later when this intense rivalry was played out to a capacity Athlone Stadium crowd….! Both Ian and I were good friends by the time and I’m sure still are, (lost contact) and the rivalry was a friendly exchange (discussing technique) as to how we are going to break the record. We both agreed that the record should not stand and the first one to get it, were just to be a formality for both. Ian whom I met for the first time at the Allenby Drive Sports ground recalling both of us preparing for the 100m final knocking in our blocks, Ian: “…. O’ you are Michael Chitter O’ …..and you Ian Rutgers”, I replied. By then both of us were known to a larger athletic fraternity and the crowds that filled the Athlone Stadium to capacity during the 1970’s. At the Champion of Champion’s meeting I recall, with hilarity, how both of us broke the record each time of our three chances and by this time the entire crowd’s attention were drawn to the long jump pit. So, both held the record for a few minutes, respectively, on the day! My distance, the best at 6.95m would be a National record standing, if Ian’s last attempt was not successful at beating this distance. The entire Athlone Stadium, shrieked with disbelief as Ian cleared 7.01m!!! The rest of course is legendary history, made by a great friend of mine and a rivalry we both appreciated and enjoyed of the other. Of course, Curries Fountain in Durban, was another episode we both enjoyed in the final of the 100m, discussing strategy. Ian clocked 11.2sec. and myself 11.1sec. in the semi – finals. We were both given the same hand time of 10.8 sec. in the Final. But, because this was a National record Ian’s “head dip”, assured him of the title of this National record. Again, we both joked how we were going to beat the rest of the other Provinces as we both hailed from Western Province and literally brother in arms against the rest of South Africa.